"A man is but the product of his thoughts. What he thinks, he becomes." Cinema is a constant journey of discovery. It makes explorers of us all, but it's an uphill struggle, even if the rewards are as precious as long-sought treasure more valuable than gold. From the moment we fall in love with the medium, we're always playing catch-up. Some we'll see, but others, during the vast majority of those nascent years, we'll only be able to read about through the writings of academics and historians. Factor in twelve decades worth of cinema history spanning the globe and the number grows exponentially, to the point where the cinephile's quest to see everything becomes insurmountable. Essentially, we're at the mercy of distributors, the availability of prints, and our own selective prejudices, only ever seeing a tiny fraction of what's available. Once you're aware of what's inaccessible, it's easy to become disheartened. For once, this is where it pays dividends to live in the modern world. In the internet age, film culture is undoubtedly global and our access to cinema from different countries, from Hollywood to Third Cinema and everything in between, is more open than ever, and unlike the explorers of old we have tools at our disposal which make the discovery of rare and forgotten cinema that much easier. One such lost masterpiece is Adoor Gopalakrishnan's Kathapurushan / Man of the Story. A pioneer of the New Indian Cinema movement in Kerala, where his 1972 film Swayamvaram / One's Own Choice is recognised as a founding work, Adoor is considered the natural successor to famed auteur Satyajit Ray. Certainly, Adoor's career is a long and comparably successful one that began in the early 1960s after he graduated from Pune's Film Institute. Since then, Adoor has written and directed eleven feature films, including Second Run's initial release, Elippathayam / Rat-Trap. His documentary features run to double that number, most of which are dedicated to Kerala's performing arts scene, with which he maintains strong links. Adoor's contributions to Indian film culture culminated in his being awarded the country's highest honour in 2004, the Dadasaheb Phalke Award. Such an accolade speaks to his considerable talents as a filmmaker, though his work is still largely unknown in the rest of the world, despite regular screenings on the festival circuit. Thankfully, this is beginning to change, and if more specialist DVD labels follow suit, his international reputation may yet grow to the point where he receives deserved recognition on a world stage. Man of the Story falls roughly in the middle of Adoor's output and sees him stretching to the full height of his creative powers. The film is a classic bildungsroman narrative, following the fortunes of Kunjunni (first played by child actors Akhil and Mithun), from his difficult birth into a high-ranking feudal family through to adulthood (now played by Viswanathan, in a particularly strong performance), as he struggles to become a published writer. Set against a backdrop of key historical events, including the assassination of Mahatma Ghandi and the reclamation of political power by the Left Alliance some forty years later, Man of the Story is an ambitious film; structurally elliptical, yet finely balanced. 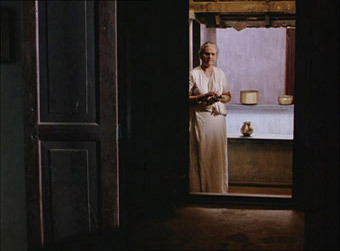 Adoor's treatment of the linear narrative is judicious, even severe, a decade elapsing in the space of one cut. We lose time, but we never lose perspective, the sweep of real Keralan history relayed through the shorthand of newspaper tableaux, so as not to eclipse the intimacy of Kunjunni's deeply personal fictitious story. The marriage of the personal and political is notoriously difficult to achieve on film, but Adoor's script is meticulously tuned, the two modes seamlessly interwoven. To this end, Kunjunni comes to embody the personal as political, through him, we learn the personal cost of political change. From the moment newborn Kunjunni draws breath, it's clear his life won't be easy. A breach birth, his first cry is accompanied by a firm hand, and a collective sigh of relief from all present. Though surrounded by strong support in the from his loving but ailing mother (Urmila Unni), and grandmother (Aranmula Ponnamma), Kunjunni still lacks paternal affection. In his father's absence, the manager of the family estate, Veluchar (Babu Namboothiri), effectively takes on the role, caring for Kunjunni above and beyond his occupational commitments. The bond between the two is deep enough that it frequently blurs the boundaries set in place by the class system, a tender equality traversing the social divide. A timid boy, Kunnjuni's confidence is severely stunted by his harsh schoolmaster's militaristic hounding, which induces a lifelong stammer. His only friend is Meenakashi (first played by Sreeja Chandran, and later by Mini), who encourages and teases in equal measure, something of a comic foil for her beleaguered companion. Throughout his childhood, impressionable young Kunjunni is influenced by the politics of his uncle Vasu (Narendra Prasad). In later life, estranged from his family and focussed on his studies, he's drawn toward Marxist ideology. His involvement in the Naxalite uprising, and subsequent arrest when he's found printing campaign literature, is another bruising altercation with authority that leaves its mark. For all his suffering, Kunjunni remains dignified, philosophically reconciling resentment. His hardships fortify his soul, encouraging him to persevere. A man pure of heart and strong in conviction, Man of the Story is a testament to the strength of will and quiet courageousness. It's unusual to see a film made in 1996 framed 1.33:1, and every now and then there comes a shot whose framing feels uncomfortably tight at the sides, making you wonder if this was the original aspect ratio. But this is Second Run we're talking about, and the restoration carried out for this release was supervised by director Adoor Gopalakrishnan, who should know more than anyone what the aspect ratio is. And what a fine restoration this is. A fair amount of dust and dirt remains, more in some sequences than others, but in other respect the image looks consistently lovely. Detail and sharpness are exceptional for a DVD, the contrast for the most part is close to perfect (it only slips in a couple of really dark night shots) and the pastel and green-influenced colour palette is richly reproduced. The Dolby 2.0 mono soundtrack has also been restored and, except for a few minor pops on some reel changes, is clear and clean of damage and noise. The dynamic range is surprisingly narrow for a seventeen year-old film, and there's little in the way of bass response, but there is also no distortion. This release marks the first ever opportunity to own Man of the Story on DVD. Truly the jewel in Adoor's crown, now it gets to shine just that little bit brighter. As has become Second Run's enviable high standard, the release arrives with a restored transfer supervised by Adoor, along with new and improved English subtitles and some tempting supplemental material. Interspersed with excerpts from the film, a relaxed Adoor discusses Man of the Story at some length. He pays attention to just about every aspect of the film, from its political roots to the emotional connection he still maintains with it today. It's a real compliment to the main feature, and serves as a great introduction to it if you're seeing Adoor's work for the first time. After all, there's nothing better than hearing a director talk about their own work, especially when they're as engaging as Adoor. There are many striking similarities between the film and his own life, Adoor has stated that he doesn't see it as autobiographical, though he acknowledges the parallels betweens the two. Adoor, like all artists, lives through his films, giving something of himself away in the process. Though he may refute any elements of autobiography, it's not difficult to see how close Man of the Story is to his heart. This 16-page illustrated booklet is dedicated solely to an essay on Man of the Story by critic and film professor Suranjan Ganguly, who's currently writing a longer study on Adoor Gopalakrishnan. Well known for his work on Satyajit Ray, Ganguly writes with a fluency born from his extensive knowledge and obvious passion. To say this is just an analysis of the film does it a disservice, since it communicates so much more. After reading, you'll come away from it with a better understanding of the film and the socio-historical context it's rooted in. If you're not usually a fan of academic writing, give this a try, because this is genuinely a pleasure to read and is the perfect primer before immersing yourself in the film. However, for those coming to Man of the Story fresh, it's best left until after viewing, since Ganguly details the entire plot of the film. Man of the Story can be sold on Adoor Gopalakrishnan's considerable reputation alone, but it can also be sold on the fact that it's a deftly-crafted and incredibly powerful film that's a true landmark, both in Adoor's career and film culture as a whole. An essential purchase.